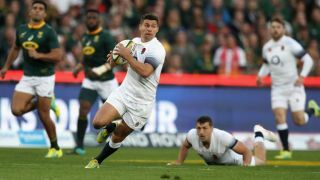 England and South Africa's Springboks are set to clash not once, not twice, but thrice in a three test rugby series which you can watch live. The games all take place in South Africa as part of England's summer rugby tour of the country. Thankfully, it's easy to catch each game as they all start at the same time. Game three is on Saturday June 23, kicking off at 4.05pm BST, 8.05am PT, 11.05am ET, 1:05am AEST Sunday morning, 5.05pm in Cape Town. Not wishing to be upstaged by the FIFA World Cup, England and South Africa started their three-game rugby union test series with two incredible encounters that ended really close. Game three of the series is on today - and we'll tell you how to live stream it wherever you are. The respective scorelines don't tell the whole story of the first two games, with England roaring out of the traps only to suffer heartbreaking defeats both times. Eddie Jones and his men have got a massive point to prove in the third and final test - this won't be your traditional dead rubber. And Danny Cipriani is back in the starting XV for the first time in a decade. Today's third game of the series takes place at DHL Newlands in Cape Town. You can watch all the action live using the handy guide below. We'll tell you how to watch, even if there's no dedicated broadcast in your country. For UK rugby union fans the entire three game series will be covered by Sky Sports. That means if you're a subscriber you can enjoy the games on your TV or via the Sky Go app on your mobile device. For those that want to enjoy the action NOW TV offers a pay per month or day-only service that allows you to watch the games on your set top box, smart TV or mobile device all without a contract commitment. Australia will get a live feed of all three of the England vs South Africa rugby matches on Fox Sports. the first game is on Fox Sports. If you are a paying customer then you can watch the action on TV or on mobile via the app. For everyone else there is the option to get a VPN and go for a stream in another country. Sorry US residents, we can't see that there's any live coverage at all of England vs South Africa in the US. None of the usual places like FloRugby or NBC are showing the test series. The only option available to you therefore is using a VPN it watch the games as if you were in another country. Where else can I watch the the England vs South Africa rugby series using a VPNg a VPN? A VPN will enable you to watch the England vs South Africa rugby series from literally anywhere. So that obviously includes: France, Italy, Argentina, Finland, Israel, Germany, Denmark, India, Netherlands, Brazil, Belgium, Romania, Mexico, Sweden, Portugal, Czech Republic, Ireland, Poland, Kenya, Hungary, South Africa, Indonesia, China, Nigeria, Bangladesh, Russia, Japan, Egypt and more!